One thing that has saved us a lot of money over the years is for me to calculate the cost of recipes when planning menus. If I know that there’s a $5 difference in price between one dinner and another dinner, I can save our family a quick $5 just by choosing the less expensive meal. 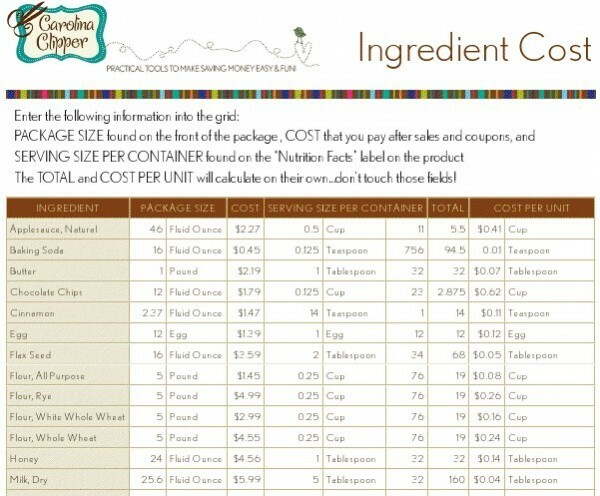 To easily calculate the cost of recipes, you can download this free downloadable Recipe Cost Calculator Spreadsheet. This spreadsheet allows you to plug in ingredient costs and recipe measurements and instantly have a final cost or a cost per serving. If you really want to make things cost-effective and streamlined, make a list of recipes your family loves sorted by price. That way, if you are really strapped for wiggle room in your budget, you can stick with those recipes that are your least expensive and save the more expensive recipes for when you have a little more breathing room. By the way, if your grocery budget is really tight right now, you might find the Hillbilly Housewife’s Emergency $45 Menu Plan helpful and inspiring. You can click on the unsubscribe button at the bottom of the emails and that should fix the issue. If it doesn’t, let me know. I really need to start doing this. Thanks for the encouragement and reminder. I did this, and it makes a huge difference. Then, after I did that, I figured out how to make the less-expensive meals even MORE inexpensive. http://www.theprudenthomemaker.com/index.php/frugal-living/eat-for-less At this point, a $5 meal for the 8 of us is something I consider one of our VERY expensive meals, since we are at $3 a day for 3 meals and a snack (.40 per person per day). We can still sometimes have the $5 dinner, if we balance it out with several $1 dinners over the month, and .22 breakfasts, and .50 lunches. We just don’t have those $5 meals very often (plus, those meals also make leftovers for another meal, so that really puts them at $2.50 or $3-$4, depending on the amount of leftovers). Your chart is a great resource! While the $45 Menu Plan at Hillbilly Housewife is interesting, you’ll note that the prices were from 2006. Just 3 years later, in 2009, the same groceries cost over $70. In 2012 , you could easily be looking at over $100. It’s my experience that this is exactly why stockpiling at low prices is so essentially to trimming grocery costs. Wow, this is a great idea and such a useful tool! Thank you so much! You can also do ‘meat switching’ to lower your cost for a particular recipe. For example, we frequently substitute turkey in tacos as opposed to ground beef as the cost of ground beef has increased. We’re also buying ground beef with more fat content (as low as 80%) as we consume it infrequently and my daughter needs more fat in her diet due to being underweight. If you don’t like spreadsheets, I find a good rule of thumb is that fewer ingredients likely means lower cost. Not always the case (filet mignon and green beans is simple but still expensive) but spaghetti is cheaper than lasagna, chicken plus rice and veggies is cheaper than a complicated chicken casserole, etc. Plus fewer ingredients often means less hands-on-time, so that lowers the total cost right there (in terms of the opportunity cost of what else you can do if you’re not in the kitchen). Good point. Just piggybacking on that thought: According to studies, we eat more when our palate (and brain) experiences multiple flavors. (The guy who wrote Mindless Eating talked about this a lot.) It’s why it’s hard to “overeat” oatmeal but pretty easy to eat a huge breakfast at IHOP. So the simpler the meal, the less we’re likely to eat of it, making it more frugal. Still, I enjoy some expensive ingredients too much to give them up. Artichoke hearts make me very, very happy. 😉 So I buy several cans when they go on sale. How do I figure coffee in to my ingredients. I have a cake that I am making and it uses 2 cups of coffee and it isn’t on your list? Thank you! !